Light, minimalist trail runner that still provides a bit of support. Enough lug on the soles to provide pretty good off road traction, but not so much as to preclude use on sidewalk or paved surface. 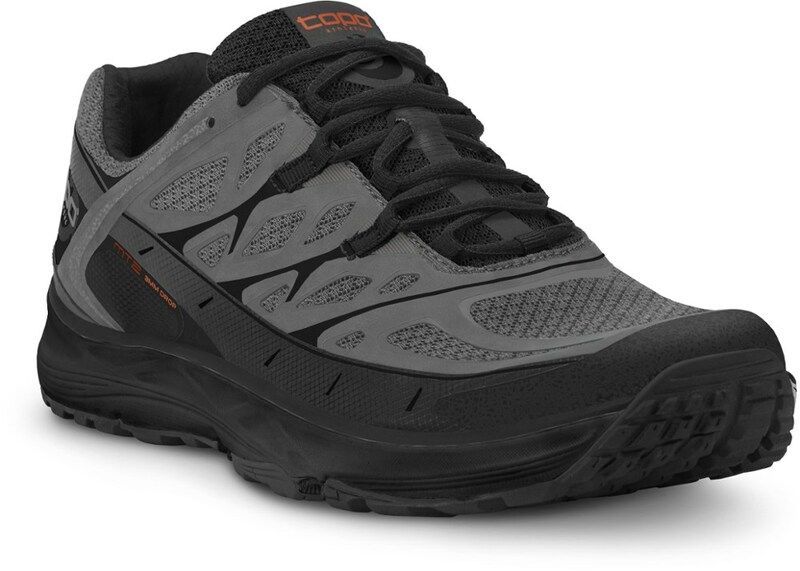 Surprisingly durable, I'd recommend these shoes for trail running or hiking with a lighter load, especially in drier climates. I think it is important to preface this review with an acknowledgement that I am really not the target audience for this shoe. A lifelong proponent of sturdy but heavy leather boots and subscriber to the theory that one should only run when being chased, I chuckled when I learned that the Topo Athletic MTs were part of the package awarded to me as Reviewer of the Month back in April. I did keep an open mind and was surprised in several ways by how much I liked these shoes. Still, my opinions expressed in this review can't help but be colored by my experience as a boot wearer and lack of experience as a trail runner. Bear that in mind as you read this review please. 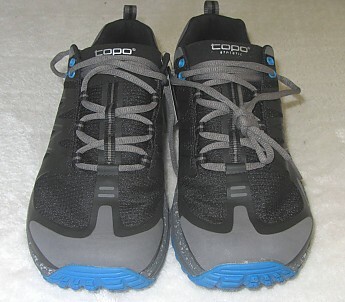 The Topo Athletic MT surprised me right out of the box with just how light and flexible it felt in my hands. The upper is a combination of very open weave mesh and more solid panels for support. Being a "low drop" design the sole remains uniformly thin back through the heel. The fit of these shoes is one area where I'll remind you that I am not a runner. I tried them on without a sock and was impressed with how comfortable they felt. The tongue is partially gusseted so protects pretty well against debris entry and the inside has no stitching or seams to rub on the feet so going sockless would definitely be an option. I didn't try running in them au natural because without socks they felt very loose and I didn't want to break my neck. Normally I'll wear an 11.5US in a sport shoe but since I expected to wear very light socks I opted to go with an 11US. 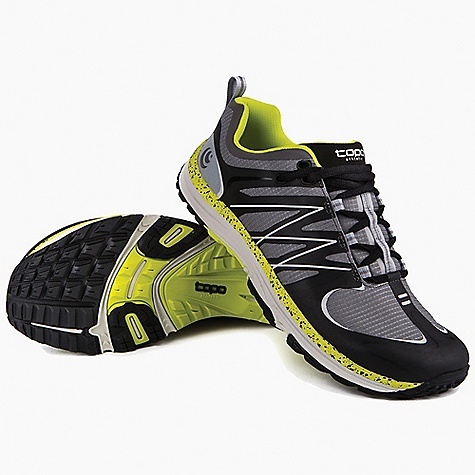 The toe box felt roomy enough, not quite to KEEN levels, but comfortable for a running shoe even on my wide feet. I found the fit with a light hiking sock to be about right for me though they felt a bit tight when use was extended during hot weather and my feet swelled a bit. I think trying these on in a store would be a good idea to get the right fit for your specific needs as unlike a leather boot these can't really be stretched to fit. Once I got over how light the MTs felt I started to notice how they worked mechanically. Initially I was aware of some pressure in the arch area but that soon faded as the shoe loosened up. I've either gotten used to the sensation or it has dissipated because I'm not aware of it when I put them on now. The sole has a bit of stiffness to it which is welcome off road but even now is still noticeable when walking or running on paved surfaces. I had some issues getting a good fit around my heels but a little research helped me to adjust the lacing to resolve that quick enough. There is just enough cushion in the area that collars the ankle to be comfortable without being restrictive or irritating. On trail the sole felt like it had a nice level of stiffness to allow for a confident stride on uneven terrain whether walking or running. Walking on rocks was not like when wearing heavy boots but not too bad unless done for extended periods. Even then I felt my feet dealing with it better as they got used to working harder so I'd blame my lazy feet as much as the shoe on this. Besides being partially gusseted the tongue has two loops for threading the laces through which I found nice for keeping the tongue in the correct position. 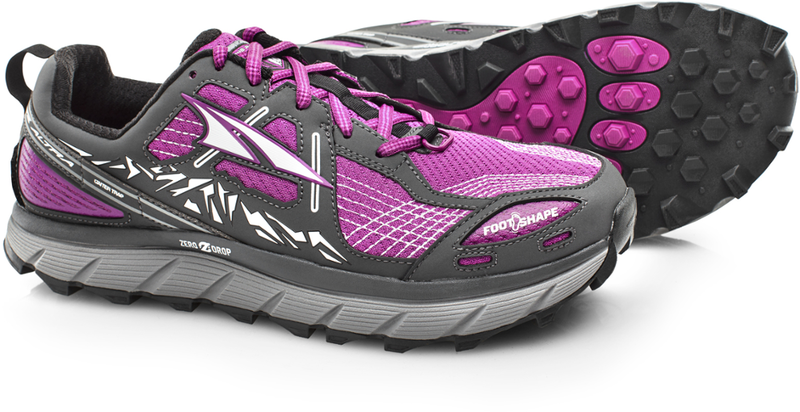 The mesh panels on the upper make it clear there is no intention for these shoes to be waterproof. Running through dew dampened grass instantly leads to moisture inside the shoe so of course the smallest step into actual water means a well soaked foot. Once soaked water seems to have a hard time finding a way out other than through the mesh upper. 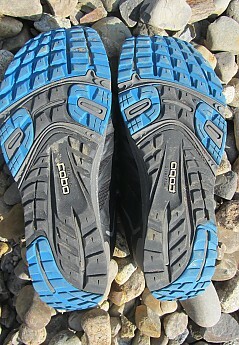 I really liked the lugging Topo used on these shoes once I got them into the woods. Combined with the stiffness of the sole it was a bit much on pavement, but not dangerously so. On trail though there was a definite feeling of confident traction. Wet grass, mud, loose rock all posed no issues. Even slippery wet logs and rocks didn't give me the slip though I took those at walking pace not running because at my age I can't risk breaking a hip. This picture was taken recently after five months of sporadic use. A little dirt and a few scuff marks, but otherwise like new. Rocks don't seem to have taken much toll and there is little evidence of wear. That same mesh that made for some water issues really pays off when it comes to venting. Heat and moisture have an easy exit out through the open sections of the upper. I was amazed at how dry my socks were after extending use on day hikes. These shoes seem made for hot climates where sweaty feet need to breath. This pattern of upper eyelets lets you use a variety of lacing styles to get your preferred fit. This picture also shows the only real sign of wear I've found. One tiny bit of stitching has come loose near the upper eyelets. 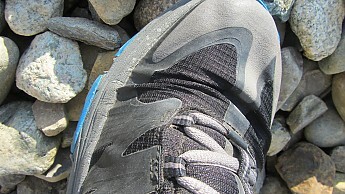 Considering the light feel to the construction and the number of rocks I've bumped and scraped these shoes against I would have expected more visible scuffs and abrasions. This seems to be a rare case where light doesn't necessarily equal flimsy. 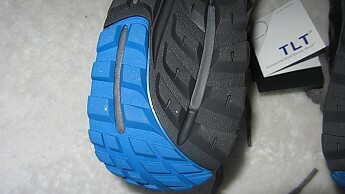 Here you can see the heel traction pad as it rolls up the back of the shoe. The toe panel wraps around the front in a similar fashion. 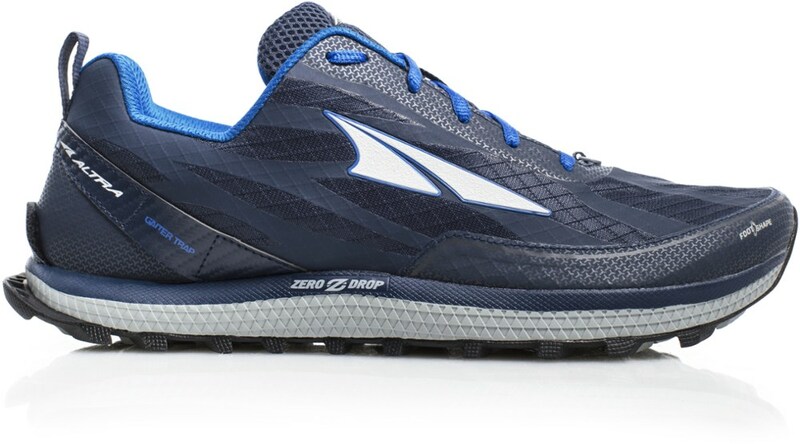 These provide a forgiving landing and take off area when running that allows for good traction on uneven surfaces or loose sand and gravel. This closeup of the flex point again shows little signs of wear. The sole material, the mesh sections as well as the solid supports of the upper show no evidence of cracking, flaking or even much in the way of scuffing. These shoes are clearly designed to take a lot more abuse than I've given them. 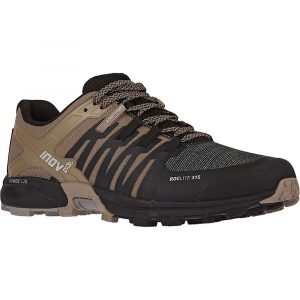 These shoes have been primarily used for light hiking on trails and paved surfaces. In five months of use I have logged roughly 4 miles of pavement running, 10 miles of trail running on primarily mud/grass type trails, 50 miles of pavement hiking and 30 miles of trail hiking with a light day pack or nothing in terms of carried load. One last thing I want to mention about these shoes is the amount of toe protection they provide. One of my reasons for wearing leather boots is to shield my toes from kicking into roots and rocks. The first time I rammed my toe into an obstruction in these Topo MTs I was prepared for searing pain and was really surprised when my foot just bounced off the rock it had hit. 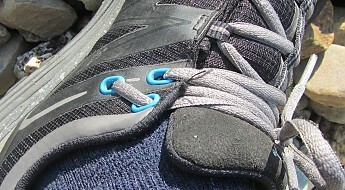 The bit of sole that wraps up over the front of the shoe and the stiff section above that make a great shock absorber. For a minimalist shoe these things provide a great deal of protection and support. I would definitely recommend these shoes based on their construction. They seem especially well suited to hot and dry climates. Runners and hikers too for that matter have such individual tastes I don't think a blanket endorsement can be made. 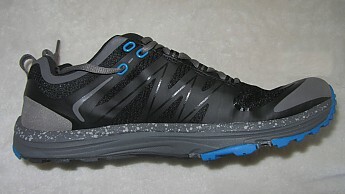 If you are looking for light and durable trail shoes for running or UL hiking I'd say put these on your list to try on. Thanks for taking the time to let us know how the Topo trail runners worked out, LoneStranger. Nice review LoneStranger. My Asolo Sunsets are wearing out (the Vibram sole is getting to be rubbish). I may just look into these shoes. Thanks. 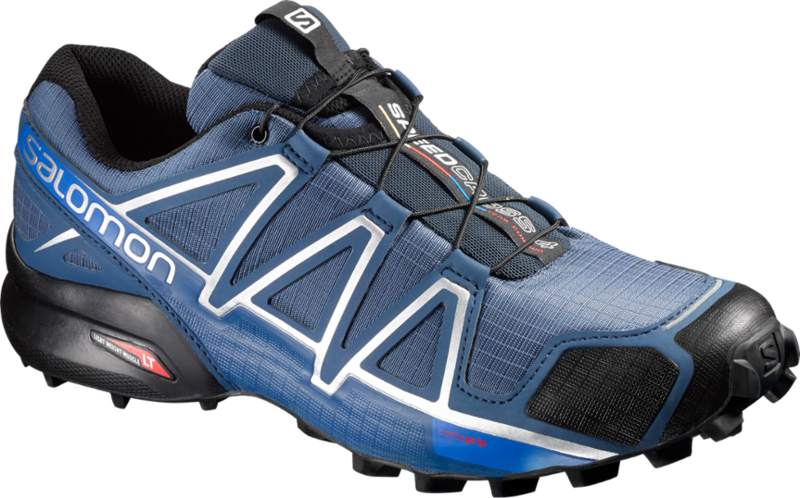 Light, flexible, zero drop, with enough protection for the average trail. I've liked the two Topo road shoes I've tried, the RT and ST. The MT is a good complement for use off road on anything other than rocky technical trails. They fit well in my 9.5, transition well, and look good as well. I like them especially for local cross country races, and wish I had a pair like them back in the ancient days of '70s cross. Welcome to Trailspace, John. Thanks for sharing your trail runners review. Whereabouts are you running with your MT's? Got any pics of your pairs to share? 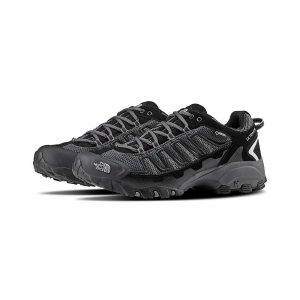 The Topo Athletic MT is not available from the stores we monitor. It was last seen September 11, 2017	at REI.